Have you ever wanted to work with horses? Now you can, and you don’t even have to change your career path. 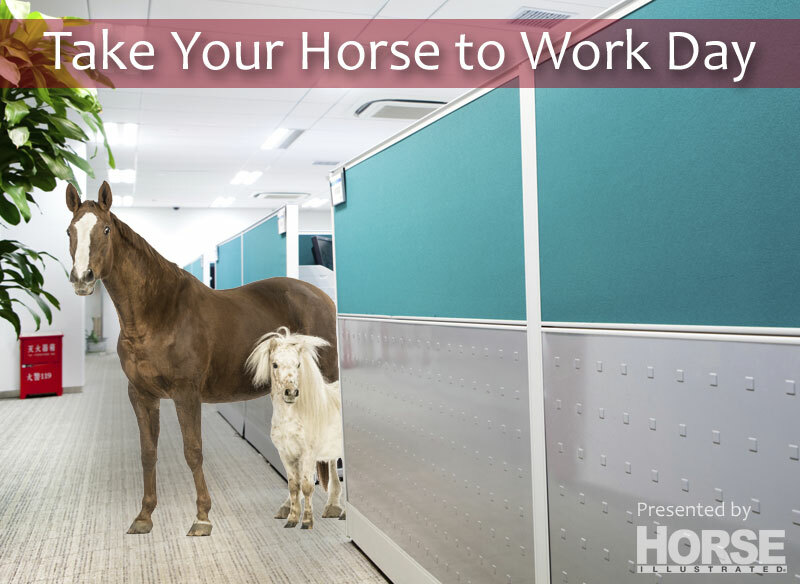 Horse Illustrated magazine is proud to announce its sponsorship of the first ever Take Your Horse to Work Day. Horse owners around the country will not only enjoy a day spent with their equine best friend, but will be able to share the joy with their coworkers. While some Silicon Valley companies boast foosball in the break room and free gourmet meals for employees, these perks pale in comparison to the rewards of horses in the workplace. Studies have shown that interacting with horses can reduce stress, lower blood pressure and even improve social skills. Productivity is expected to increase as employees reap the benefits of having these animals around. The list of advantages to allowing horses at work goes on and on. Many workers are expected to commute by horse on TYHTWD, which will help reduce the number of gas-powered vehicles on the road. When participating horses enjoy their lunch break on office lawns, it will help reduce company landscaping expenses. TYHTWD will be popular in office environments, but why stop there? Imagine visiting your morning coffee stop and seeing a pony behind the bar. Think of the joy your children will feel when their teacher rides into the classroom on horseback. And surgery patients will feel at ease when a noble Clydesdale is the last sight they see before drifting off into an anesthesia-induced slumber. “We expect TYHTWD to be a big hit, and we intend to lead the way here at the Horse Illustrated editorial offices,” says Moyer. “We’ve changed our main stairway to a horse-friendly ramp. Our break room is stocked with fresh carrots and apples. And we have buckets and shovels stowed strategically around the building. OH MY!!!! Wouldn’t that be neat. Could we have a take your horse to school day?? Actually how about a ‘skip school and go ride your horse’ day! I am a teacher and did bring my gelding Charlie to school for the Great American Teach in. He loved it and so did the kids….aged headstart to 5th grade. Brought tack, trunk, trailer and carrot slices. Have pix of every class and hands on. I highly recommend it! My gleding is a rehomed horse so we talked about how to care for animals and the commitment it takes. The kids still talk about him. Haha! I love it! If only. 20 years ago I used to ride my horse to work. Stabled him there and then rode home. When I got my first job at 15 I rode my horse to work every day. Now I ride my horse to work at my veterinary clinic whenever I can (which isn’t often due to the distance and daylight limitations.) I will definitely ride on TYHTWD! I would love to take my boy to work one day. Is today the day? Sure hope not, I would like to participate! When is take your horse to work day supposed to be? Even though it’s an April Fool’s joke, this does a great job of illustrating how absolutely ridiculous it is to allow people to bring their dogs to the office, a thing which actually happens in some companies. So, well done, Horse Channel! Not sure what horsieperson has against dogs in the workplace though. I like to take both my horse and dog to work. Well I really do! I just don’t think goats would be appropriate to take to work as they eat a lot of stuff that co-workers may cherish. Cats don’t believe in working, so they are out, but parrots can be fun at work, too. I honestly have taken horse and dog to work. I am a trainer and teach horsemanship, that’s why! 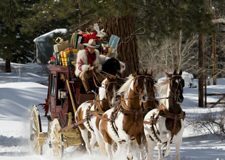 I have taken my horse to work on several occasions! Love it! But they do stay outside. Does it have to be a whole horse, or can I take my Congressman? Great April Fool’s that we wish were true!!!! There would probably be about 1000 deaths on this day if it were to be real lol! When you work at a horse stable, it’s “Take Your Horse to Work” every day! When I had a job, I always had a picture of my horse…does that count. Here at Circle T Arena in Hamilton, Texas, we are very fortunate we have these privileges! http://www.circletarena.net Come and see what we are all about! We truly are Texas’ Best Arena! HI Spy: What’s on your holiday wish list?